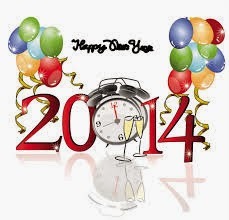 I wish all readers of Bruce's Journal a happy and healthy new year. I appreciate your stopping by whether I know you or not or if you are a regular reader. It is unusual when the NJIT Highlanders come to NYC or Long Island to play, but they faced the Hofstra Pride last night at the Mack Arena. So we drove over to see the game. Since it was played during the Christmas-New Years break, the crowd was small. The Highlanders got off to a slow start as Hofstra scored 9 unanswered points to start the game. 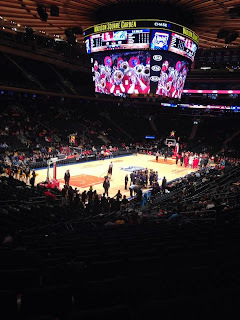 I felt that NJIT was not penetrating and was relying too much on 3 point shots. 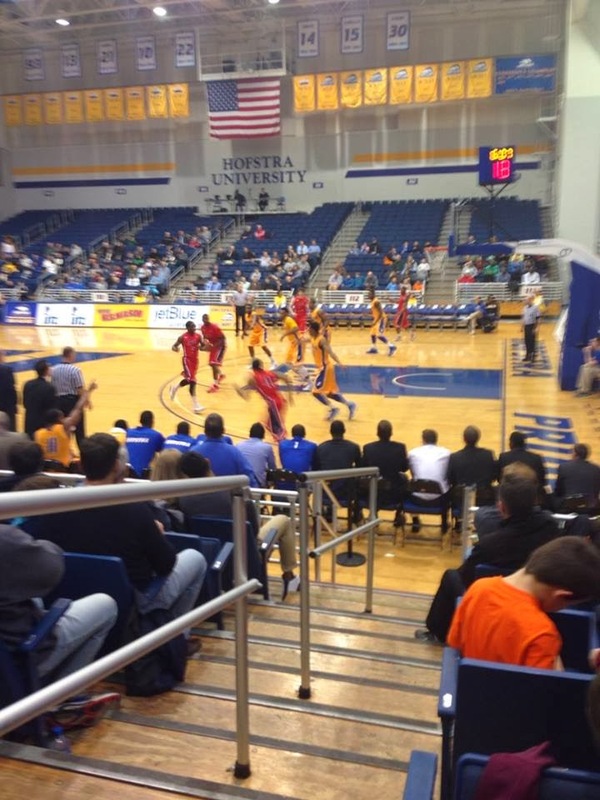 They trailed during the entire game, but late in the game cut Hofstra's lead to one point. 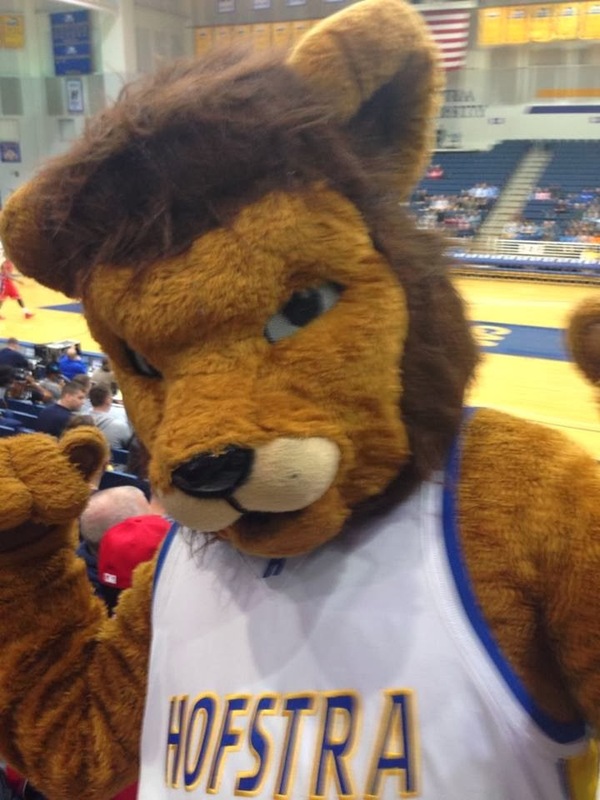 I was able to take a photo of the Hofstra mascot seen below as he circulated throughout the stands. 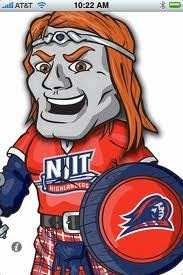 The NJIT Highlander mascot seen below was not at the game. Perhaps he was on vacation. Maybe I'll run into him when I return to work. 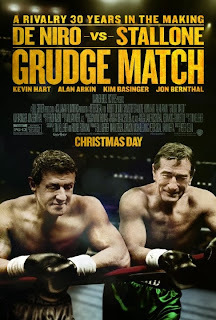 In 1980 Robert De Niro starred as Jake Lamotta in the film Raging Bull. Likewise beginning in 1976 Sylvester Stallone starred in several Rocky movies. 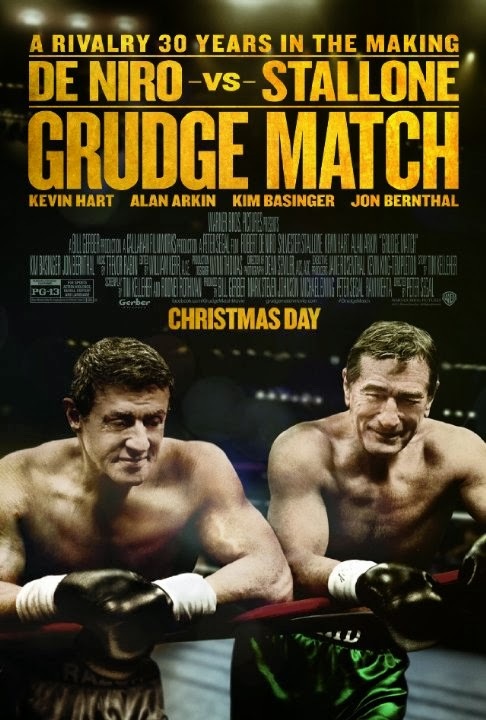 Since it was raining so hard today we decided to go over to the local multiplex to see Grudge Match where De Niro and Stallone starred as fictional boxers Billy "The Kid" McDonnen and Razor Sharp. They originally fought each other 30 years ago, but came out of retirement to fight each other again. 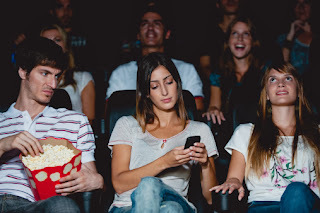 During the movie an inconsiderate person started to use her smartphone which created some visual discomfort in a darkened theater. I asked the person to put it away. When she persisted Karen went out to get the theater manager to stop her. If you want to surf the web or text message, why go to the movies? Just stay home. I guess some people are just addicted to their phones. 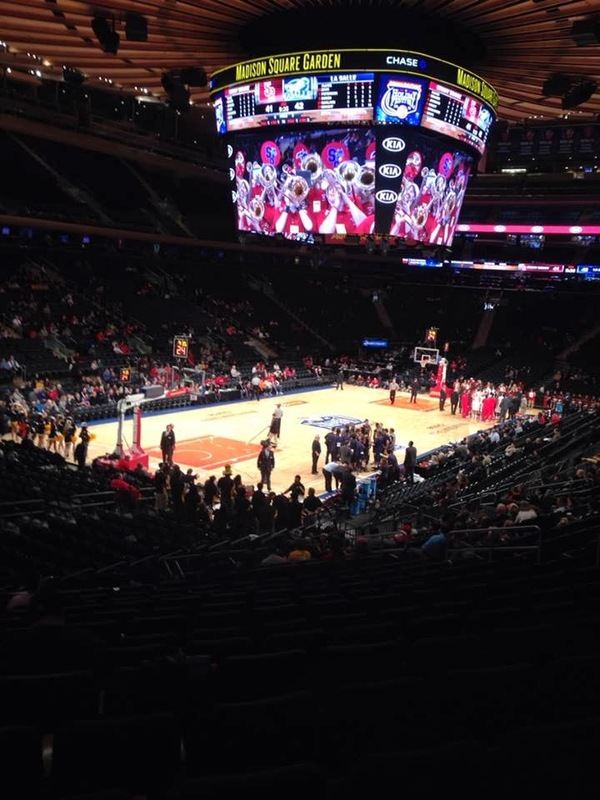 There was a college basketball tripleheader at Barclay's Center. In the first game St. Johns faced Columbia in a battle of locals. The defenses were very tight as there were many forced shots coming shortly before the 35 second shot clock expired. I was impressed on how Columbia stayed in the game but the Red Storm held on to win 65-59. We did not stay for the third game which featured Virginia Commonwealth against Boston College. 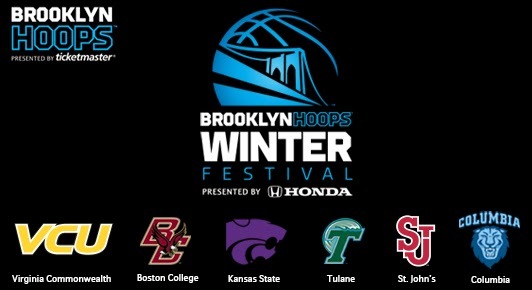 I do think that a festival like this should feature 6 schools from the NYC region as attendance at this event was very low. Most of the fans left after the St. Johns/Columiba game. I think there are likely few alumni of Kansas State or Tulane who live close by and would come to Brooklyn to see the game. If I remember correctly Karen and I vistited the Jewish Museum last year just after Christmas Day. We went today to specifically see Co-Mix, a retrospective of Art Spiegelman and Chagall: Love War and Exile. When we got to the museum just before opening time at 11 AM there was already a line of people wanting to get in. Art Spiegelman grew up in Rego Park as I did and was only a year older than I. I vaguely remember his name back then, but I was not acquainted with him. He is noted for writing the book Maus using comic book characters to tell the story of his parents in the holocaust. The exhibit featured other works of his. Marc Chagall was a Jewish artist born in Russia who emigrated to France after the revolution. Many of his paintings wer shown. I was surprised to see how crowded the museum was especially at the Chagall exhibit. The upper floors were permanent exhibits that we saw last year, so we did just took a quick look. It was a pretty active day for me since I am off from work until January 2. Karen and I went to the bank to move money from one account to another. It is a shame that the interest rates are so low these days. The rate for our savings account is only 0.2%. We set up a 5 year CD with some money for 1.5% interest which is still very low, but it is the safest investment possible. After that I watched Who Wants to be a Millionaire with Cedric the Entertainer. From there I drove out to Douglaston and walked around Little Neck Bay. We ate dinner at Ben's Deli in Bayside. On and off throughout the day I listened to Rewound Radio featuring the top 77 as voted by the listeners. 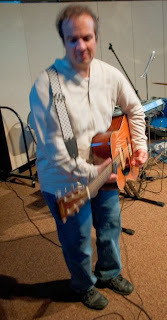 I am not a "survey guy" as I believe that if I like a recording, I don't care what number it is. 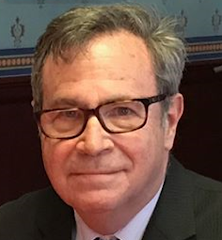 I commend Tom Natoli, Mike Riccio, Frank Thomas, Allan Sniffen, and Bob Radil ( I apologize if I omitted anybody) for all the hard work they put into this programming. I am especially impressed by the anecdotes about each of the songs that made the survey. I was please to see that Like a Rolling Stone was voted #15. The important thing was that this was an honest compilation of the actual votes. Many commercial radio stations do surveys, but the results are obviously "fudged" so that songs consistant with the stations format make the survey. You can read what is in the picture above or read what I have to say. 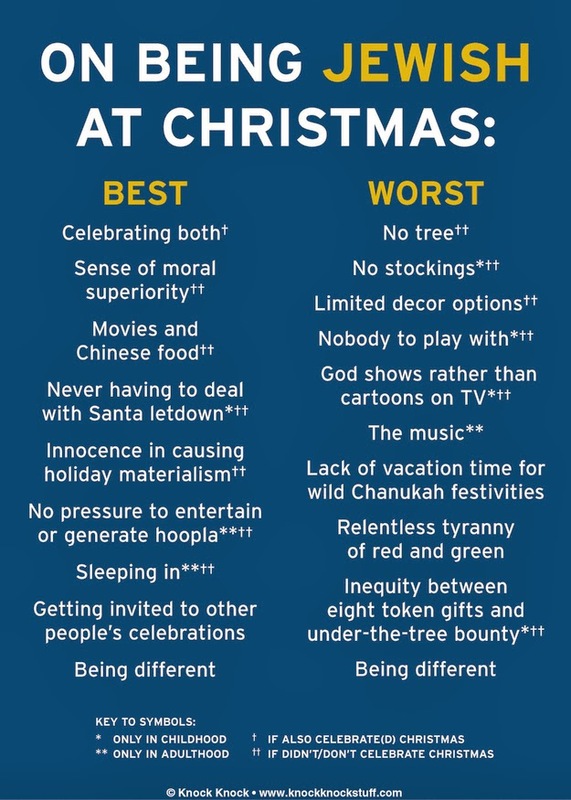 I always have that "funny feeling" of being left out at Christmas time. We don't open up gifts on Christmas or have a large family gathering. 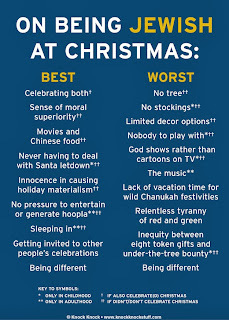 Many gentiles do forget the significance of the holiday as it commemorates the birth of Jesus Christ. I remember back in the 1970s before I was married there was always a Jewish singles dance on Christmas Day or Eve. It was your last chance to get a date for New Year's Eve. In the mid 1970s when I lived in New Brunswick, NJ there was a group called the Dunhams that held such an event. We called it a JAP Festival. (JAP=Jewish American Princess). That expression and singles dances have become passe over the years. I will take in a movie tomorrow, but pass on the Chinese food. 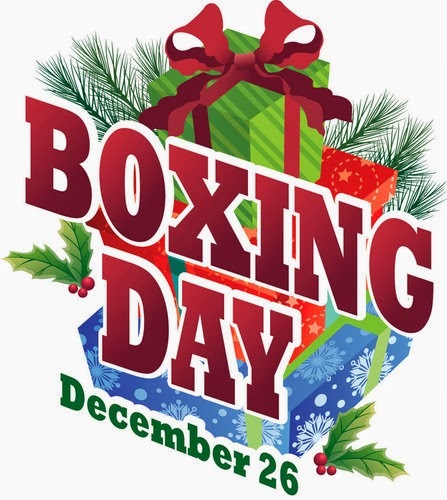 It will be nice to be off from work until January 2. About once a year I like to survey readers of Bruce's Journal to get some feedback. About a year ago survey results advised me that I make too many typographical errors. I have tried to correct this, but inevitably I will make some errors. The survey is short, so if you have a minute or so, I'd like to hear from you. 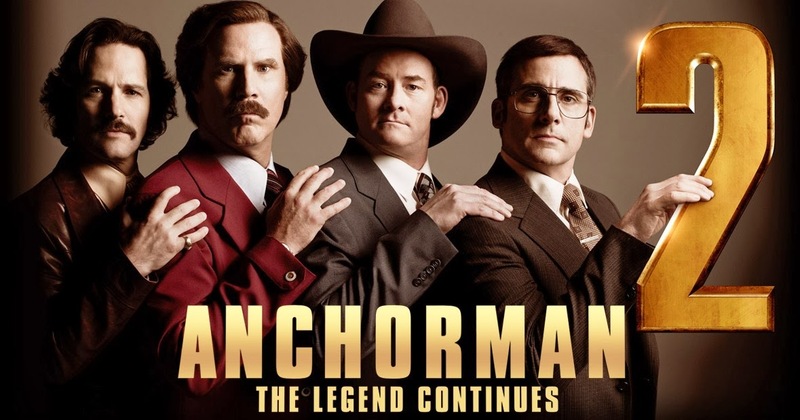 Maybe I am just getting too old for the mainstream movies. (I think I have said that in this journal before). Anyway, I thought the humor in this film was stupid, warped, obnoxious, etc. There were only 10 or so people in the theater and I didn't hear too many laughs. 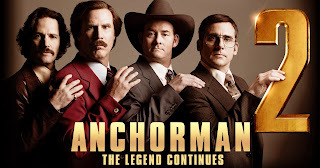 My next trip to the multiplex will be on Wednesday. Hopefully, the movie will be better. They discuss his early career from 1961-66. Just click on the link below and can view it for free. When there is a big snowstorm as seen above schools and businesses close and everyone is "happy" to get a snow day. Today there is a forecast for 2-4 inches of snow. Mr. G said it will be light for a while but will be heavy from 11 AM - 1 PM. This is the third light snowstorm we've had in the last week. These small snowstorms are a nuisance since everything is open and we have to travel in poor conditions. You know the old saying. 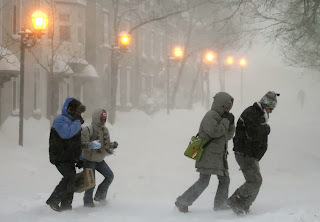 "People talk about the weather, but don't do anything about it. 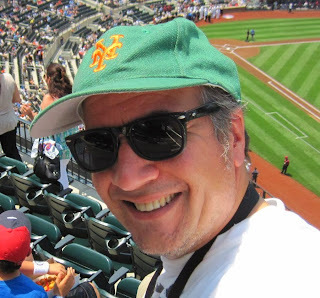 I found out on Facebook that today is the 65th birthday of Bob Shannon formerly of WCBS-FM. 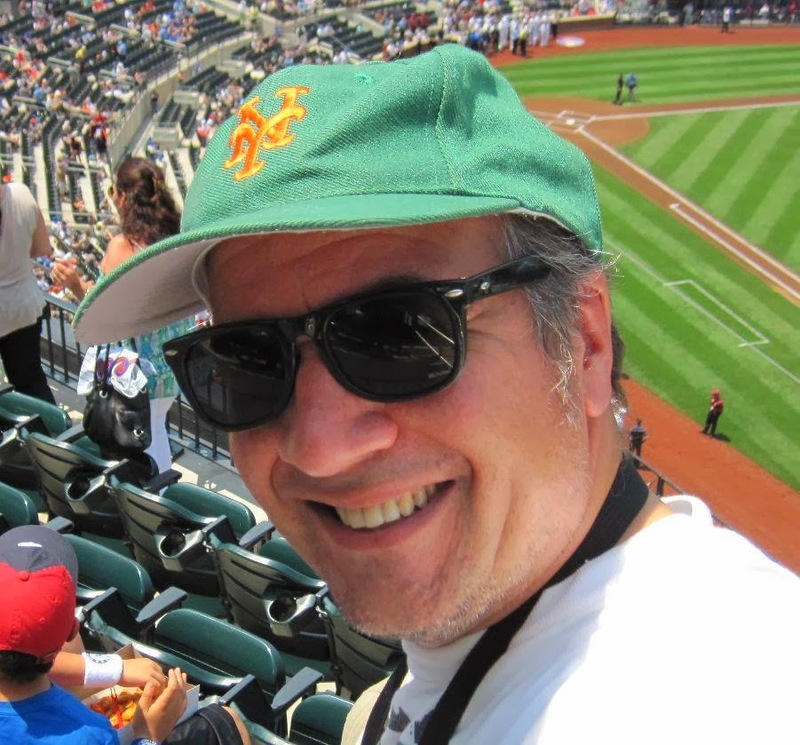 The photo above was taken at the CBS Radio Expo at Yankee Stadium in June 2010. 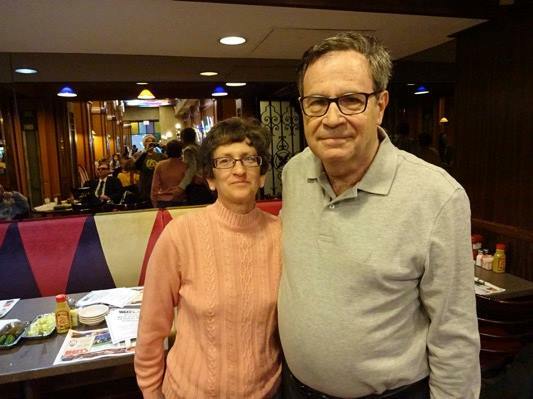 Bob has not been heard on WCBS-FM or WLNG since December 2011. There was never a statement made by either station. 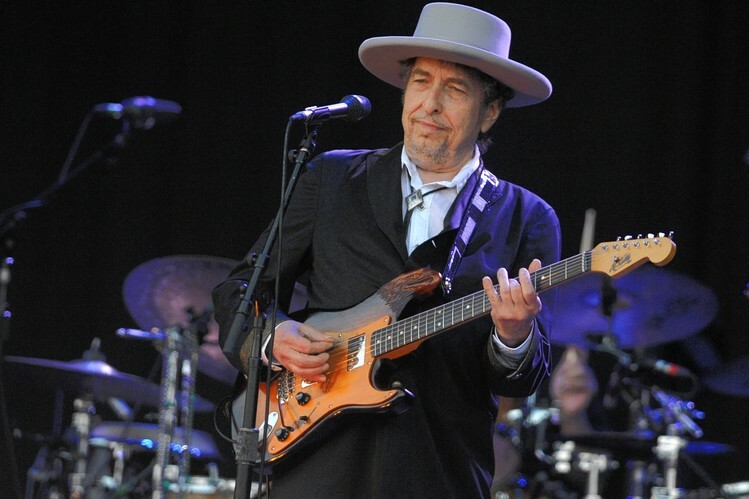 We heard from the various radio message boards that he left due to health reasons. No specifics were given and I certainly want to respect his privacy. 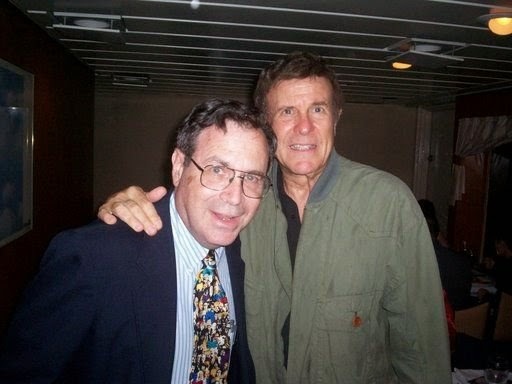 He was an asset to WCBS-FM for the many years that he worked there. I remember him fondly for announcing Lee's birth on his show in March 1988. He played "What a Wonderful World" by Louis Armstrong and said "what a wonderful world it is that we can welcome a new listener." Lee has been a loyal listener to WCBS-FM for all those years. 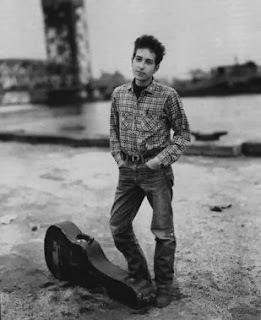 My best wishes for a happy and healthy birthday to you Bob. I remember first hearing this on Cousin Brucie's show on WABC all those years ago. I haven't heard it in many years, but thanks to YouTube, I just heard it. Thanks to WFUV for playing this at 6:10 AM. It was a good wake up song. How many of these e-mails are useful these days? On all accounts most e-mail is advertising. After making online purchases I am bombardeded by emails advertsing more products from that vendor. Very few emails are useful these days. I did a search on Bruce's Jounal and found several entries to my adventures at the dentist in recent years. It used to be a visit every 6 months for a check-up and cleaning, but as I have gotten older dental problems surface. A few weeks ago my periodontist (gum specialist) found an infection in my gums. She suggested that I visit an endodontist (root canal specialist) whom I visited today. More tough luck as I will need a root canal. Stay tuned. Over the past 3 years Madison Square has been renovated and modernized. It is better to do this than to build a new arena. I believe the cost of these improvements must have been about $1 Billion. Of course the fans must pay for this when they buy tickets. Since tickets for the Knicks are prohibitively expensive, we decided to go to a few college basketball games at the Garden. We came in the middle of the first game as LaSalle defeated Stony Brook 65 -57. The Mets signed Curtis Granderson for $60 Million over 4 years. It seems to be a step in the right direction, but I am concerned with his strikeouts and his ability to hit home runs in spacious Citifield. He does the potential to hit 40 home runs a season, but many can turn into long flyball outs in Flushing. Let's hope he doesn't turn into another Jason Bay. The Seattle Mariners signed Robinson Cano for $240 Million over 10 years. He is a very good ball player, but is not worth that money. The Mariners will really be burned if he sustains major injuries in the middle of the contract. The Yankees could be in serious trouble next season especially if Derek Jeter can not return to form. Jacoby Ellsbury has been injury prone in the past. Their farm system is weak and may not be able to replace those who retired or moved to other teams. When I think of Nelson Mandela I think of Paul Simon's Graceland album. Under African Skies was one of my favorite cuts from that album. Anyway, today I received a friend request from Bob Dearborn seen above. His name sounded familiar in the radio context. He worked at many radio stations in different locations over the year. 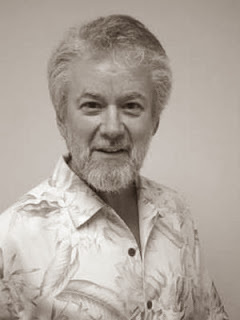 He is best known for his time (1970-76) at WCFL in Chicago. Nice to meet you Bob!